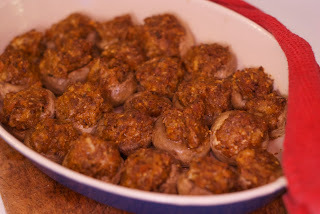 For this most happy day, one of those rarities named after a saint, but celebrated by non-Catholics all over the world, let’s break tradition and make stuffed mushrooms. Go ahead! Think outside the box of chocolates! You know, not every culture thinks about Valentine’s Day in the same way. In Japan, on V Day (as opposed to VJ Day) it’s the women who buy the chocolate for the men. Men get to return the favor on White Day in March, or as we would choose to call it in America, if we had one, which we don’t, Multi-Culture Day. Lots of symbolism with mushrooms. Mushrooms, in some cultures, are phallic symbols. All the more reason stuffed mushrooms are a great choice for V-day. Many men really identify with the short and stubby varieties. In China the mushroom indicates long life. In some native cultures of South and Central America, as well as Berkley, California, they indicate, like, you know, really, really cool stuff, man. I think they can be prescribed in California. Anyway, we’re not using those kinds of mushrooms. Ok. Enough history and worthless facts! We don’t need no stinkin’ facts! We need food! Open a sturdy red wine and let’s get to the heart of the Valentine issue. What kind of mushrooms are we going to use? We’ll use agaricus bisporus, or as my beer swilling, stained t-shirt friends call them, button mushrooms. Agarius grows in practically every grocery store. Conveniently, they grow already cleaned and plastic wrapped. But, just to be sure, we’ll wash them. Note: Mexican chorizo is soft, the texture of American pork sausage. Puerto Rican, or Spanish style chorizo is smoked and has a hard texture. Use either one, but first remove the casing. Preparing the filling: Either finely chop the mushroom stems, breadcrumbs, and Puerto Rican chorizo together in your food processor, or finely chop them by hand. Drizzle in a little olive oil. If using Mexican chorizo, fry it in a pan, breaking it up with a spatula, as you would hamburger. When it’s cooked, add it to the breadcrumbs, etc. 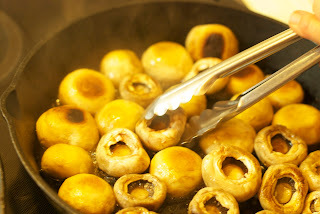 Put the filling mix in a pan and briefly cook it to get the water out of the chopped mushroom stems. (See Photo) When it cools enough, add your favorite cheese. I’ve used cheddar, queso blanco, Monterrey jack, among others. 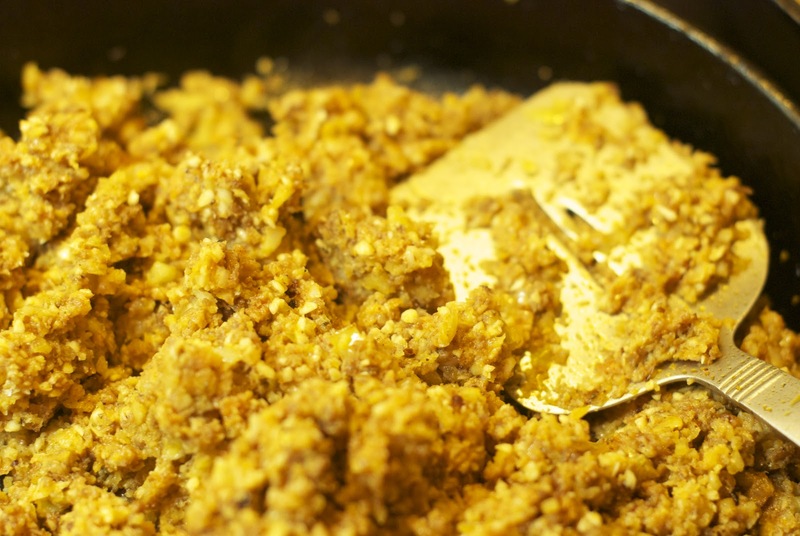 Stuffing and cooking: Salt and pepper to taste. Grab the spoon of your choice, mound the filling onto the mushroom caps and place them in a baking dish. Put them in the oven and bake for about 10-15 minutes or until the filling is beginning to slightly brown. (See Photo) Serve hot! Guillermo,muchas gracias for introducing me to these. I had never had them before and they were delicious. I love that they are so easy to make and are great as appetizers. I can't wait to make them. Guillermo, muchas gracias for the recipe. I had never eaten these before and they were scrumptious. I love that they are easy to make and are great as appetizers. I will definitely be making these. Lots of variations and you're such a good cook! I know your version will be muy delicioso.